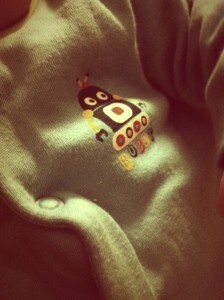 Enigmatic AND cool in a robot babygro! It’s been a while. But with good reason. If you follow me on Twitter or are friends on Facebook then you will know that we are now a family of three. Our baby, Isaac, arrived on 1st December and has been our primary occupation for the last 5 weeks. This post is a bit of an explanation about why you’ve not “seen” much of Isaac. Sally and I both use social media a lot so you may think that it would be entirely natural for us to keep some detailed online records of the pregnancy, birth (well, not the birth, but the immediate time after), and early days with our boy. BUT…our interest in social media actually swings us the other way. We appreciate the highly public, potentially insecure, and increasingly commercial nature of social media and we’ve taken the line that we want Isaac to have a substantial amount of choice about what is published about him online. We find it embarassing enough when our parents bring out the box of baby photos. As far as possible we don’t want Isaac to have all his embarrassing newborn and childhood days already online for the world to see. So, for now, we are not publicly posting lots of photos and videos of him. We’ve really enjoyed seeing the children of friends and family of ours grow up through photos and videos, mostly posted on Facebook. We’re really very proud of our little boy, he’s a very cute little kid, and we love showing him off. We have made some really good friends that we mostly interact with through the medium of social media. But we also have other friends who’ve taken the more private route and I don’t find we miss what isn’t there. That’s not entirely the end of the decision though. We value technology and its ability to store and present information. So we do have a private space online for close friends and family to keep up to date with Isaac’s latest news and photos. If you know us well then there are other ways in which you will get to see Isaac as he grows up, if not in person (which, I can tell you, is by FAR the best way). If you REALLY want to see some photos then drop me a line and we’ll see if we can send some by more private means. Or, just take my word for it. He’s an amazing little man with a face from Sally’s side of the family and Ross’ big hands and feet. He has lots of funny facial expressions and a growing vocabulary of little noises. And we love him to bits. I respect that: you’ll notice that on our blog the boys are featured but I try not to show their faces clearly.